alaTest har samlet og analyseret 150 anmeldelser fra magasiner og hjemmesider. Mange kan virkelig godt lide brugervenligheden. Vi analyserede bruger- og ekspertratings, produktalder og andre faktorer. 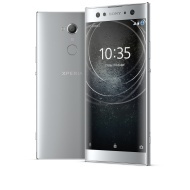 Sammenlignet med andre Mobiltelefoner får Sony Xperia XA2 Ultra en samlet alaScore™ på 92/100 = Fremragende kvalitet. The Sony Xperia XA2 Ultra upgrades the mainstream XA2 with a huge screen and a whole bunch of selfie-taking goodies such as a high-end dual-selfie rig, OIS, autofocus, and a front-facing flash. Selfie, Selfie. "Two rear-facing cameras? That is so 2017!" Sony's latest mid-range smartphone Xperia XA2 Ultra features a front-facing dual-camera instead in order to improve selfie quality. Let's find out whether or not this was a smart move, shall we? And it’s also worth remembering that Honor produces an 18:9, 6in smartphone for £100 less than the XA2 Ultra. Although its battery life and performance aren’t quite on par, it’s slimmer and lighter, so might have the edge depending on your tastes. Sony is about to release a series of new Xperia smartphones. Among them will be the Xperia XA2 and the Xperia XA2 Ultra. Here you find more info about the specs of the new devices.